In a decades-spanning career, Queen would have a great many busy periods filled with writing and recording albums, extensive touring and solo projects. You could just about point to any year and see the band members in the thick of creative endeavours. Strings of hits would carry their music around the world and make songs like “We Will Rock You,” “We Are The Champions” and “Another One Bites The Dust” part of the great cultural tapestry. In 1973, though, all of that was in the future. As the year began, Queen had already recorded their first album months before and both they and their management company, Trident Audio Productions, were still struggling to find a record company to release it. Live gigs were intermittent and money was tight. Visitors to Kensington Market could still find Freddie Mercury and Roger Taylor running their clothing stall there to make ends meet. Following a spell of warmer weather in London, it was a sunny, dry day on February 5th of 1973 as Queen arrived at Langham 1 Studio to record their first ever BBC session. Freddie Mercury, Brian May, John Deacon and Roger Taylor brought with them the tapes of four songs, which had been recorded the previous summer for their debut album. The songs Queen would record that day for the BBC were “My Fairy King,” “Keep Yourself Alive,” “Doing All Right” and “Liar,” and the tapes would serve as backing tracks for these new versions. With new vocals, including Roger singing the last verse of “Doing All Right,” and the overall production stripped down, Queen’s debut BBC appearance aired on February 15th as part of John Peel’s Sounds Of The Seventies Radio 1 show. The band had been playing clubs, colleges and halls for nearly three years by this point and at last was reaching the wider radio audience. Prior to the release of both Queen’s first single and first album came what would later be considered the first Freddie Mercury solo release. In 1972, during the summer recording sessions for Queen’s first album, producer Robin Cable enlisted Freddie, Brian and Roger to work on cover versions of the tracks “I Can Hear Music” (originally by The Ronettes) and “Goin’ Back” (originally by Goldie, but made famous by Dusty Springfield). Cable and EMI issued the tracks on June 26th of 1973, just ahead of Queen’s debut releases, but did so not as Queen songs. The artist’s credit was given to the fictional “Larry Lurex,” a joke name in reference to Gary Glitter. Not long after, on July 6th, Queen released “Keep Yourself Alive,” backed with “Son And Daughter,” as their lead-off single. A week later, on July 13th, the self-titled album, Queen, landed in UK record shops. Another broadcast first was in store for the band, too, but not quite the way one would expect. To promote the release of the album, the BBC had been sent a white-label pressing of the record for use on their TV show The Old Grey Whistle Test. The problem was that no identifying promotional material was sent with it. As the famous story goes, producer Mike Appleton liked the first track from the album and had stock footage edited to the music so it could air on the show, all without knowing who the band was that was playing. The song was “Keep Yourself Alive” and it aired on Whistle Test on July 24th. The following day, July 25th, Queen returned to Langham 1 Studio in London and recorded their second BBC session. 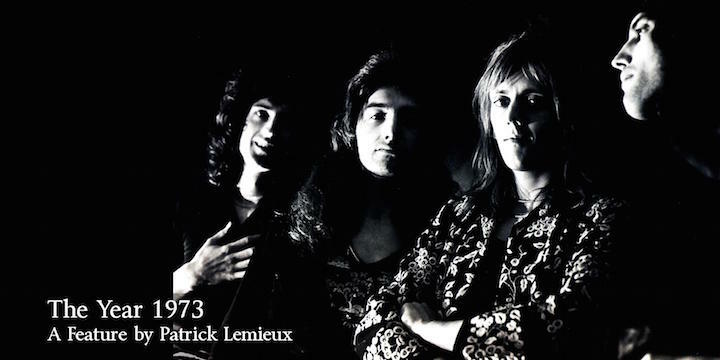 The band recorded “See What A Fool I’ve Been,” a second BBC take of “Liar,” a brand new version of “Son And Daughter” and a second BBC take of “Keep Yourself Alive.” Three of the songs appeared on their debut album and “See What A Fool I’ve Been” was a live staple on the time with a long, interesting history. It was adapted from part of the Sonny Terry & Brownie McGhee song “That’s How I Feel,” reworked by Brian May, and dating all the way back to his and Roger Taylor’s days with the band Smile. “Son And Daughter” featured the first Queen recording of Brian May’s famous guitar solo. A shorter version was recorded in 1969 as part of the Smile song “Blag,” but that would not be released until 1982, long after Queen became world famous. It was in these relatively early days that the band still carried the pieces of its recent past in the form of such Smile material. Another such example was “Doing All Right,” which was also a Smile song. After the new album’s completion, and while the band awaited its release, they hit the road in the late summer and autumn of 1973 with live dates. For their In Concert series, BBC Radio 1 recorded and broadcast the band’s September 13th performance at Golder’s Green Hippodrome in London, making it the earliest professional concert recording of the band. The new material was now placed front and center for the audience, as the band opened the show with “Procession” and “Father To Son.” “Son And Daughter” continued to frame Brian’s guitar solo, which would be the norm until it was given a home in “Brighton Rock” in 1974. “Ogre Battle” also made an appearance. It was a song new to radio listeners and the record-buying public, but as noted earlier was a live staple by this point. Queen’s previously recorded second BBC session was broadcast by Bob Harris on Radio 1’s Sounds Of The Seventies on September 24th. Amid their touring that autumn, where they both supported Mott The Hoople and headlined their own dates (even playing a gig each in Germany and Luxembourg in October) Queen were asked to do another BBC session, what would be their third in 1973. Once again recording in Langham 1 Studio, Queen recorded entirely new versions of “Ogre Battle,” “Great King Rat,” “Modern Times Rock ‘N’ Roll” and “Son And Daughter.” “Ogre Battle” by now was as much a seasoned veteran of their live repertoire as “Great King Rat” and “Son And Daughter,” the latter of which still housed Brian’s solo, extending to an epic 7 minutes. Roger Taylor took lead vocals on his song “Modern Times Rock ‘N’ Roll.” The session for these four tracks took place on December 3rd and John Peel broadcast them on Sounds Of The Seventies on December 6th, nearly eleven months since their first BBC session. Queen closed out the 1973 Mott The Hoople support tour with two December dates at the Hammersmith Odeon. A Christmas concert on December 28th supporting 10cc at the Top Rank Club finished their live dates that year. It remained to be seen what ups and downs waited the band in 1974, but 1973 was productive for Queen. Even though their first single failed to chart, their first album was gaining traction with respectable record sales behind it. Neither fame nor success were a given even at this point in their career and neither came quickly or easily for Queen. But a foundation was being built as opportunities presented themselves, like those of the BBC sessions. 1973 had arguably been the band’s busiest year to date, but 1974 would demand even more from them. They would enjoy their first real chart success soon enough in the coming year, but that was still a little ways off. Until then, there was still a PhD thesis for Brian to work on and the stall in Kensington Market for Freddie and Roger to manage.